The band "La Pamplonesa" actively participates in the famous fiestas of San Fermín that take place every year between the 6th and the 14th of July in Iruñea - Pamplona. The music of the band sounds in some of the most important events of the festivities such as txupinazo, which marks the beginning of the festivities on July 6 at noon, the religious processions of days 7 and 14, the fair of the bull or the early risers that precede the most characteristic of the sanferminero acts, the encierro. On July 6 at 12 o'clock begin the Sanfermines and La Pamplonesa is the protagonist in the soundtrack of the party from the first moment. After playing in the hallway of the town hall, he paraded through the streets of the old town, accompanied by thousands of people. In the afternoon, the same day 6, the well-known Riau-Riau is celebrated. With a route that goes from the town hall to the parish of San Lorenzo, originally the band accompanied the municipal corporation. In recent years, La Pamplonesa travels alone, but very well accompanied by everyone. The targets are celebrated from the 7th to the 14th at 6am. 45m in the morning and until 7 o'clock. 30m Each day the route is different, with the intention of covering all the old town of Pamplona between 8 days. In a way, La Pamplonesa is the alarm clock of those who will attend the confinement and, in passing, brighten the last moments of the Sanfermin night. 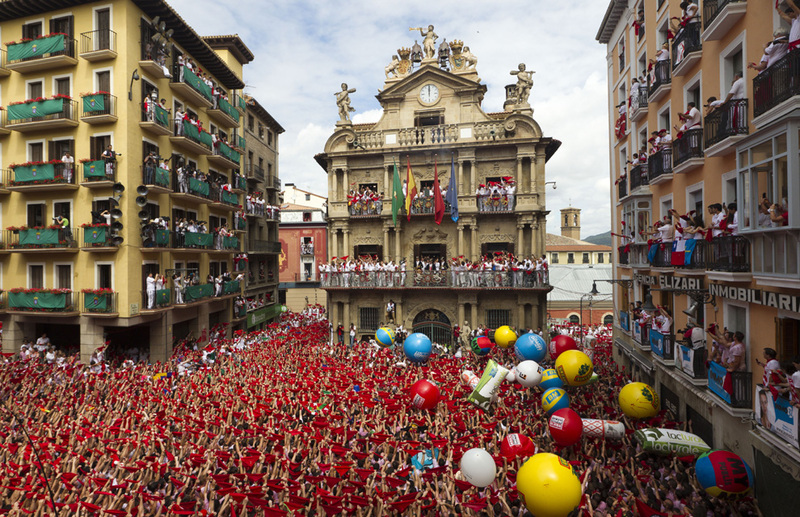 July 7 is the big day of San Fermín and Pamplona and the people of Pamplona dress up (in white) for the occasion. The procession is the great act of the Sanfermines, crossing the old town several times and going through the most important places such as the town hall, the cathedral and the parish of San Lorenzo, from where San Fermín departs. Pamplonesa is part of the cortege next to the cathedral chapter, city body, comparsa of giants, txistularis, pipers and group of dances. And for that he interprets the most suitable repertoire for each moment, either as a parade or parading in the procession. Tens of thousands of Pamplona and visitors listen with admiration and applaud the Band in this act. From 7 to 14 July at 5pm. 30m., Bullfighting hour, La Pamplonesa accompanies in a curious parade the mulillas and alguacilillos that will take part in the bullfighting celebration. From the Plaza Consistorial Pamplona to the Plaza de Toros, passing through the Plaza del Castillo, sounds a pasodoble bullfighter that surprises everyone in its path. Today is one of the few places where this act is maintained and more and more are coming. Once in the Bullring, La Pamplonesa interprets pasodobles in the tasks that really deserve it, as well as in the moment that passes between one and the other. Finally, a jot warns that the celebration is over. The Octava de San Fermín is on July 14 and celebrates the eighth day since the day of San Fermín, July 7. Coinciding with the last day of the Sanfermines, La Pamplonesa parades from the town hall to the parish of San Lorenzo, where the mass in his honor will take place. On the way back, he performs various dances along with giants and dantzaris, who put a finishing touch to a celebration in which thousands of people participate. 7 Dianas 6:45 a 7:30 Chapitela, Plaza del Castillo, Pozo Blanco, Zapatería. 8 Dianas 6:45 a 7:30 Nueva, Plaza del Consejo, Zapatería. 9 Dianas 6:45 a 7:30 Zapatería, San Antón, Taconera, Nueva. 10 Dianas 6:45 a 7:30 Mercado, Aldapa, Navarrería, Dormitalería, Bajada de Javier, Compañía, Curia, Mañueta, Mercado. 11 Dianas 6:45 a 7:30 San Saturnino, Mayor, San Francisco, Plaza S. Francisco, Ansoleaga, San Saturnino. 12 Dianas 6:45 a 7:30 Nueva, Plaza S. Francisco, San Miguel, San Antón, Zapatería. 14 Dianas 6:45 a 7:30 Mercado, Aldapa, Navarrería, Mañueta, Mercado.